Back by popular demand for the 4th year is my custom birds nests! In case you missed these last year, here is a little info on what these are about. 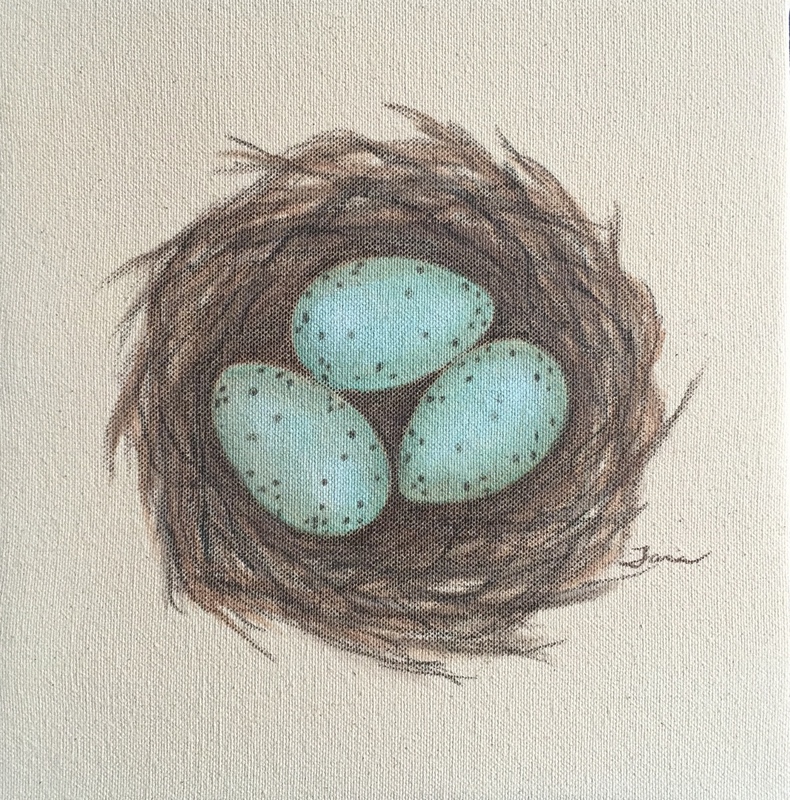 I make 9X9 inch mixed media paintings on canvas of nests with eggs representing children in them. There are many customizations that I do to make these little gems as personal as possible. These make great Mother's Day gifts or any day gifts and look great on a collage wall! These will be for sale for a limited time through May 6th. 1. Number of eggs- Depending on how many children are represented, I can paint as many eggs as you like! 2. Size of eggs- You can have larger eggs painted representing children, or smaller eggs painted to represent grand children. Or you could combine and do both! You can also use the smaller eggs to symbolized miscarried babies if you wish, I ask that you email me first to request unique customization like this before ordering. 3. Color of eggs- Depending on whether they are boys or girls I will paint either blue or pink. 4. Speckles- This year I am offering the choice of either brown speckles, or gold speckles if you are looking to add a little bling. You can order these nests on my website www.taradeetscreek.com or by clicking HERE. Last year I did a custom birds nest different than any I've ever done before. 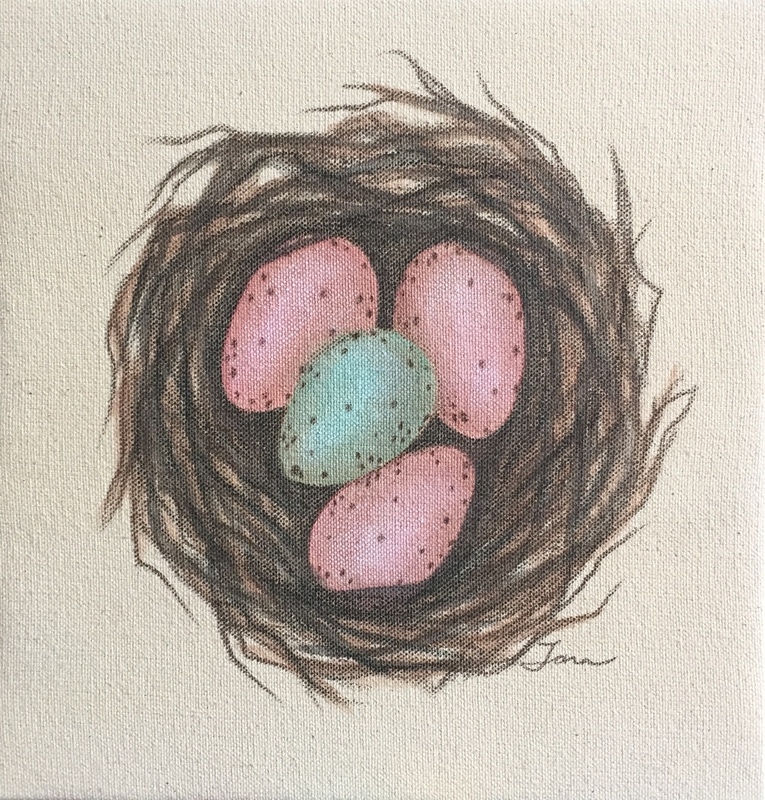 Someone asked me to do a nest with eggs in specific colors that were unique to each child. This family has a unique situation where they brought in 3 children into their family where they went from a family of 4 to a family of 7 just like that! Today, as I was painting nests I received an email from this mother who ordered this nest from me last year. It was so amazing and encouraging, I just had to share! She wrote, "I love, love, love my birds nest. I'm sure you hear that all the time, but I don't think I ever told you how perfect it is for me and I want you to know the very way you painted it is such a blessing to my heart. You had no way of knowing, but the specific positioning is an incredible window to the dynamics in my home and after looking at it in awe for about a year, I decided I wanted to share it with you. I don't know if it'll all make sense, but I hope I at least get the point across that God totally directed your hand as you created this piece and I am so grateful! Above the teal egg is her little yellow sister, above the pink egg are her two brothers. The two on the bottom are the oldest girls. They carry the weight of the sibling group and act both as a team of leaders and personal adversaries. The way the eggs are situated it's like they are facing away from each other, but close at the bottom showing they have each other's back. Pink, standing nearly upright, points her chin up and stands strong to keep the others up. The blue egg nestled in the middle is our middle boy. The richest color that you used, he is the deepest and experiences emotions the most intensely, he is in every way the epitome of middle child and is situated smack dab in the middle of all the eggs, just like he is at home. The two blue eggs are nose to nose, and in real life those two are best friends, and sometimes yellow gets a little jealous. Yellow is supported by her big sister teal and they are super close, but yellow is leaning toward green, her same-age boy cousin who she spends most of her time with. Green, up there on the top, seems the most detached from the rest, supported by big brother but not facing each other, and distant from big sister pink. He struggles to fit in and feel accepted. The eggs opposite each other- pink and yellow, blue and green- are the kids who are the least bonded to each other. As I look at this painting it is so much more than a piece of art. It is a gift from God. I see the hand of God bringing our family together and weaving these kids lives together. I see that our situation is no unfortunate accident but a divine appointment. It is a reminder that I am exactly where He has created me to be in this moment and that He's got them, on the days when I feel like the chaos is too much, I'm not alone, He's holding us. 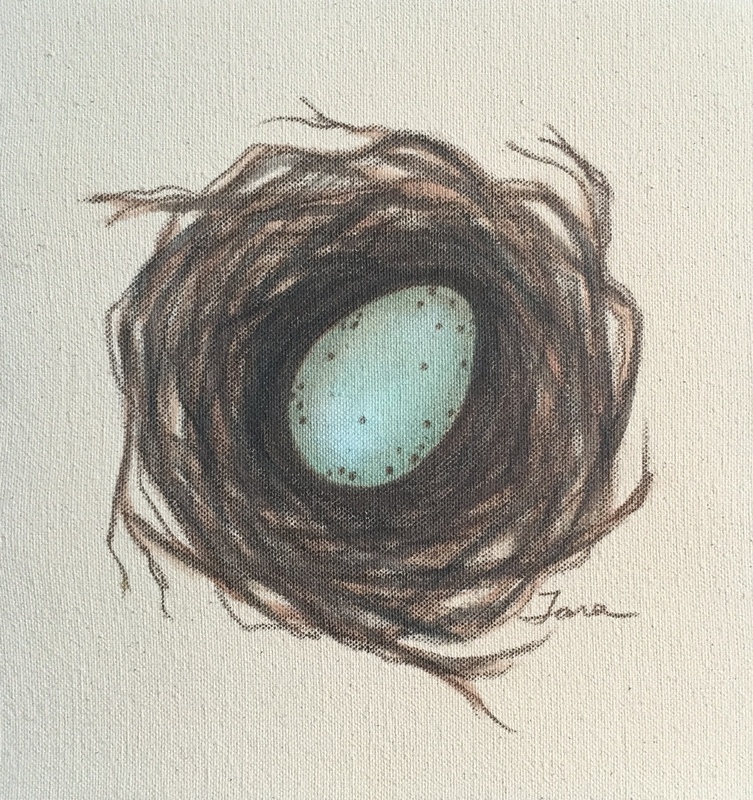 I may imagine the eggs as the children and the nest as my home, but God has reminded me that He is the forest that the nest is in, so much bigger than I can even imagine and I find great peace in that." Recently, God has been showing me a few things. 1. He is showing me that art is POWERFUL, more powerful than we can even imagine. 2. That He is using my art to SPEAK to others and bring healing and encouragement, when I least expect it to. 3. It is more important to have SUCCESS through God's eyes than the world's eyes, because his ways are higher than mine. Back by popular demand for the 3rd year is my custom birds nests! In case you missed these last year, here is a little info on what these are about. 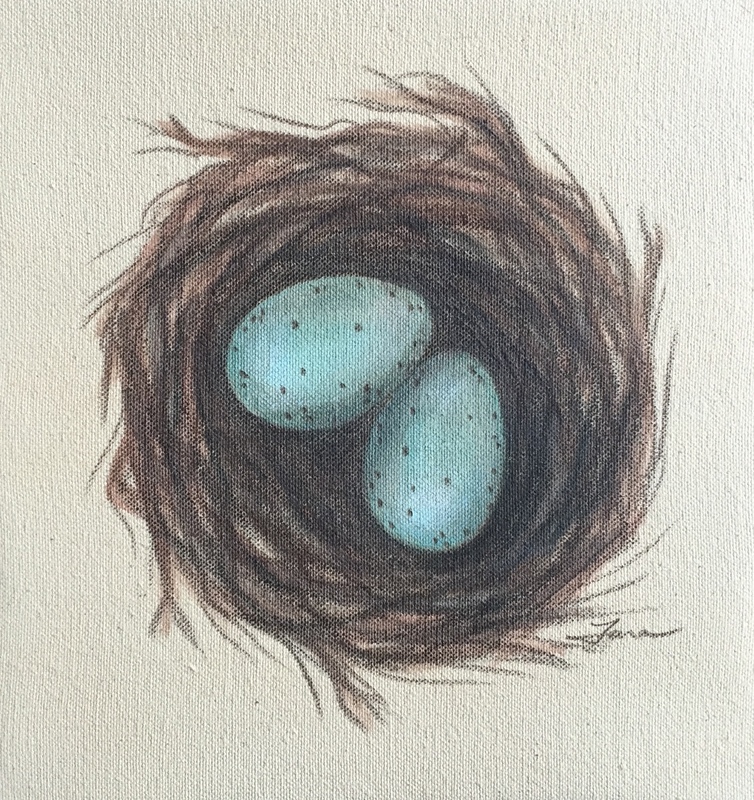 I make 9X9 inch mixed media paintings on canvas of nests with eggs representing children in them. There are many customizations that I do to make these little gems as personal as possible. These make great Mother's Day gifts or any day gifts and look great on a collage wall! You can order these nests on my "Custom Birds Nests" page on my website www.taradeetscreek.com or by clicking HERE. I began this nesting by doing my first giveaway on Instagram which was so much fun! The winner turned out to be my friend Audrey who was happy to win this to give to a friend. I loved this whole giveaway experience and I will definitely be doing it again! As I worked on my canvases, I clipped them on this wire in my studio until I was ready to mount them. I mounted them on wood with a staple gun and then wrapped them up in paper and twine for people for them to give as gifts or for them to open themselves. I just love how some of these nests ended up being displayed in peoples homes! These small canvases are perfect for collage walls which really seem to be "the thing" right now. Seeing my art in people's homes brings me great joy! It is an honor to have something I have created on display for others to enjoy and connect with. I hope these nests tell lots of stories without words to people. I hope they bring deep joy and healing to others as well.